Restaurant Review: Fast Food Breakfast Showdown | The Food Hussy! Breakfast is the most important meal of the day and I've become a bit of a connoisseur to the fast food breakfast. I'm not hungry when I wake up - or when I leave the house - as a matter of fact - food sounds gross at that point. But then 30 minutes later when I'm at my desk? STARVING! We're going to start at the bottom. Poor poor Taco Bell. 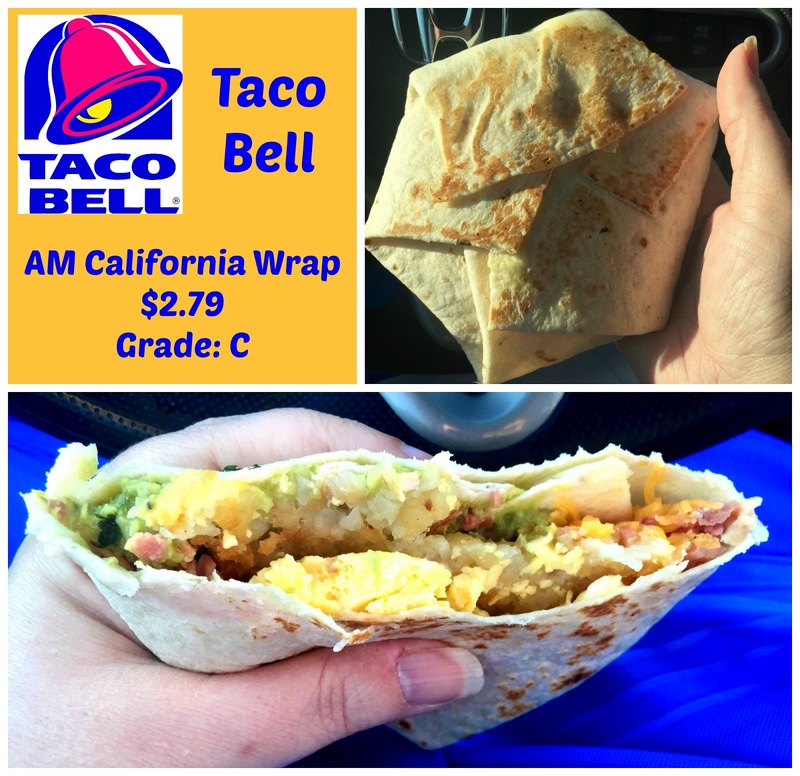 I tried their "Biscuit Taco" when it first came out and it was awful. I couldn't even finish it. This time I went for the AM California Wrap - it's got a hash brown, scrambled eggs, bacon, guacamole, cheddar cheese & pico de gallo. It was kind of dry and very bland and - not surprisingly - the guac wasn't great. All in all it was just meh and I didn't finish it. The guac was the best part. Just because it's breakfast doesn't mean it HAS to have eggs - this would be better without them. 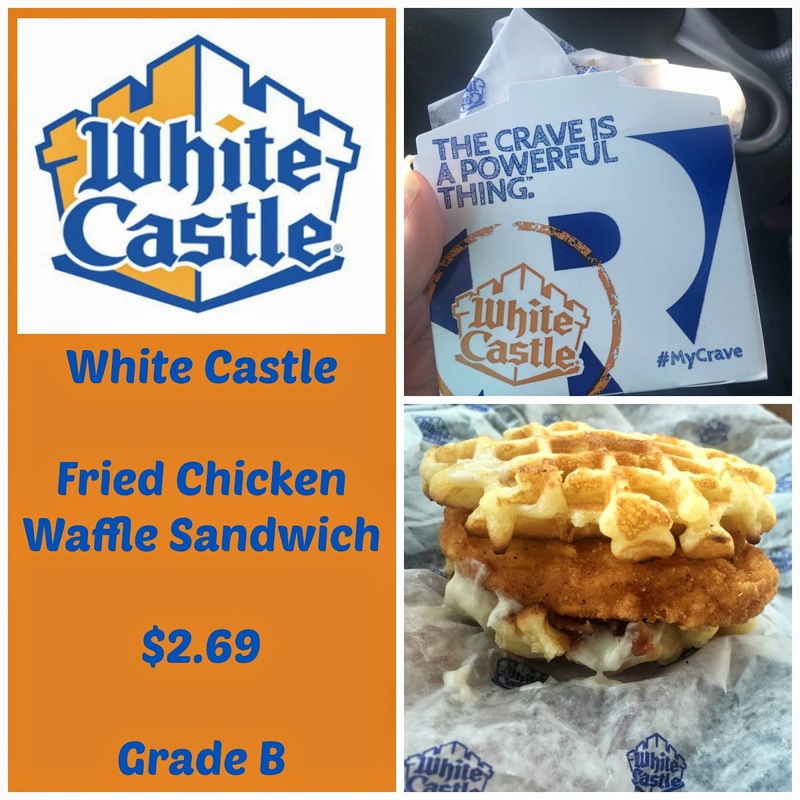 Next up - White Castle. I normally am a big fan of Whitey's breakfasts. The eggs on their sandwiches are REAL eggs! But there was something new on the menu so I decided to try it - the Chicken & Waffle Slider - with country gravy & bacon crumbles. This was pretty damn tasty. The chicken was moist - the gravy was sauce and the bacon was mapley. I think their waffles might have some syrup in them because I definitely tasted syrup. While I did like this and it was very unique - it gets a B for its sheer size - it's a big breakfast sandwich - a little too big. If you're really in the mood for chicken & waffles - it's pretty good - and hearty! 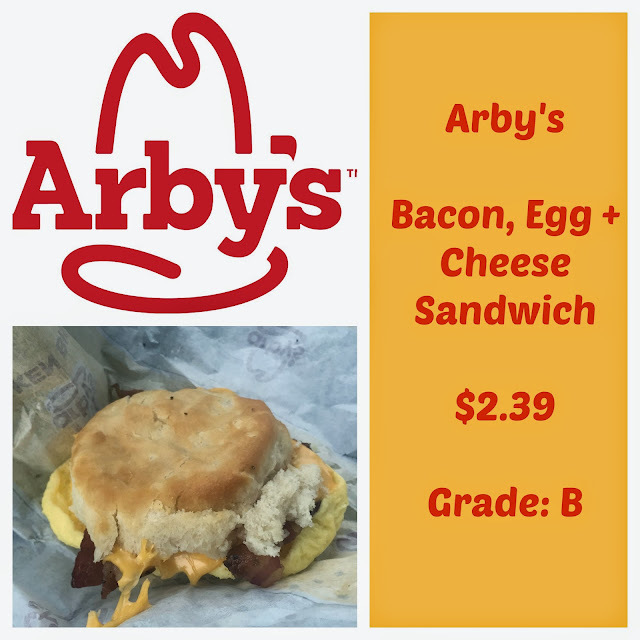 Next on the breakfast quest: Arby's! This is the closest to my house but I've never been there for breakfast. I went with a straight-forward Bacon, Egg & Cheese Biscuit. The biscuit was good and the whole thing was probably twice the size of a McD's equivalent. I liked it - but again - too much too finish. Bigger isn't always necessary - but a very solid option. 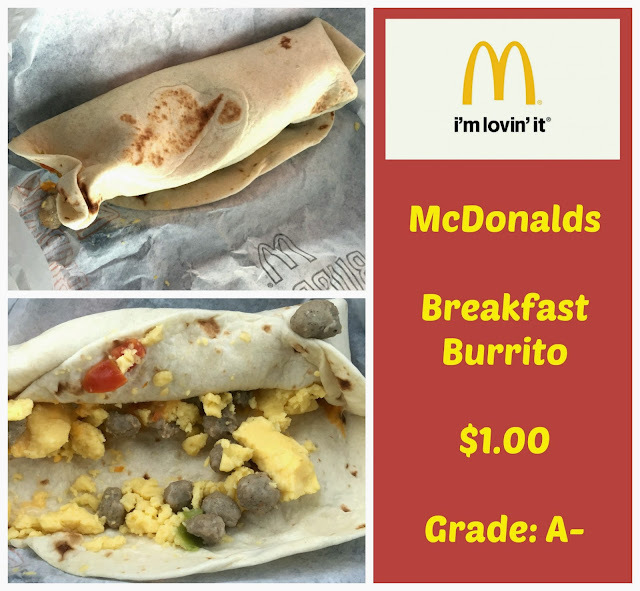 And now - my #3 selection for best fast food breakfast - McDonalds and their Breakfast Burrito. It's got sausage nuggets (that's a kind word - looks like rabbit poo - but tastes delish - and I mean delish in a completely crappy bad for you but way that I love), something red (tomato? pepper?) and cheese. These are super cheap - only $1! I know - most people would hate them - but I absolutely love them. I keep thinking I'm just going to make my own and have them all ready and pack them - and then - I just keep ending up in their damn drive thru. They get an A- solely because they range in quality from fantastical to disapppointing depending on hotness and amount of cheese. 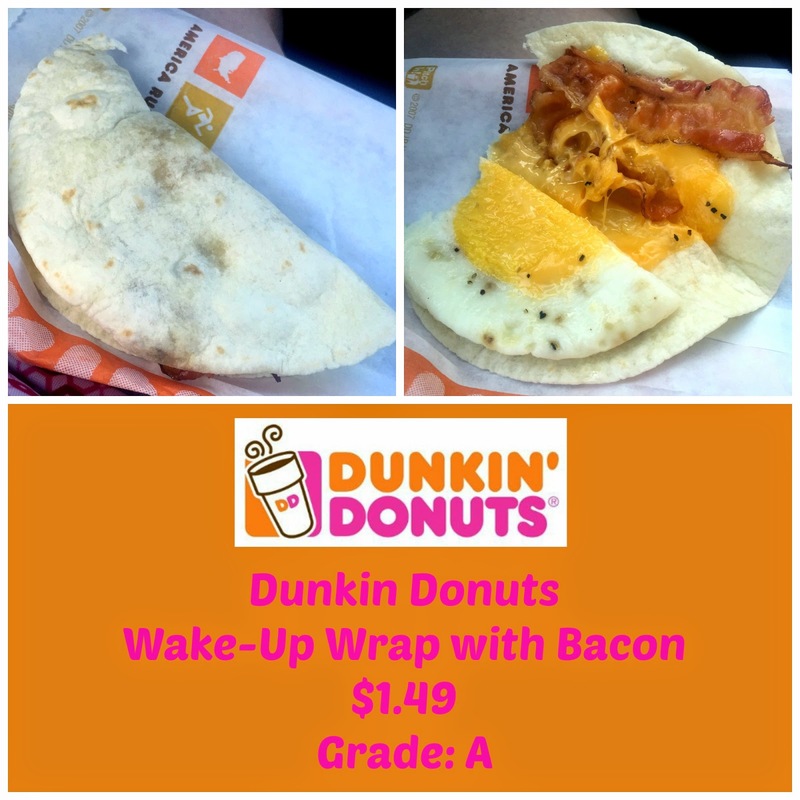 A new addition came up to the #2 spot - Dunkin' Donuts. I went for the cheap option - the Wake-Up Wrap which you can get with bacon or sausage. Day 1 I got bacon, day 2 - sausage. Yes it was so good - I went back again! And - at $1.49 - it's a great deal! These are definitely microwaved because they come out super hot but it was still good. I like the spot of the DD because I it's on the corner - going the way I go - so it's super easy to do the drive thru. 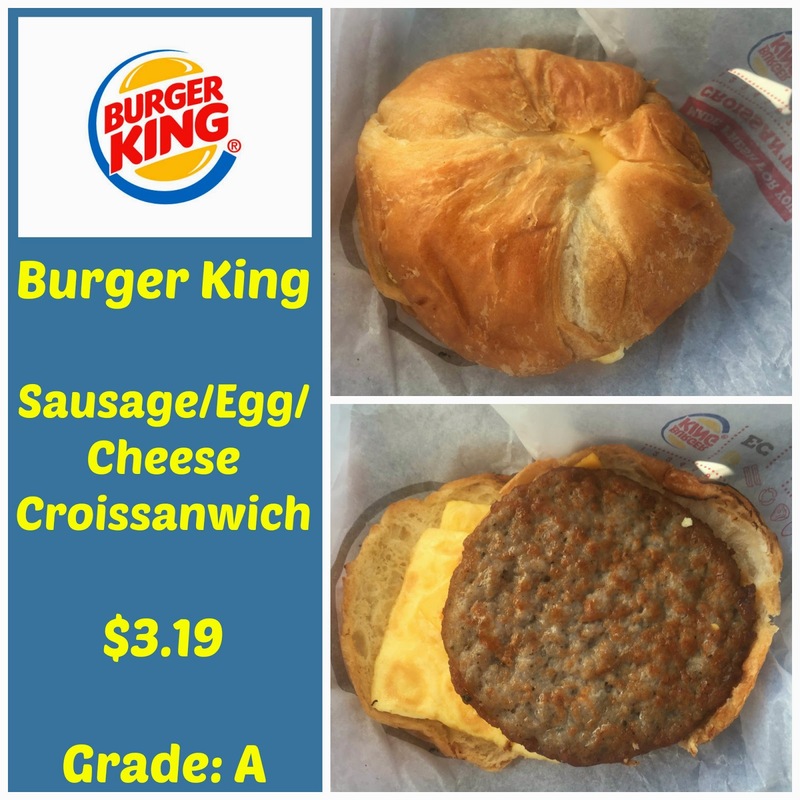 My #1 Fast Food breakfast was, is and always will be the Croissanwich at Burger King. When I buy frozen breakfast sandwiches - the sausage, egg & cheese croissant is always my go to. This is #1 because the croissant is soft and buttery, the sausage is never overcooked, the scrambled eggs are fluffy and the cheese is melty. I love it. So - after all of this terrible-for-me food that I ate - what do you think? What is your favorite fast food breakfast? Is it weird that I don't feel comfortable packing milk to just have cereal? Talk to me!